Why does BRS recommend this? 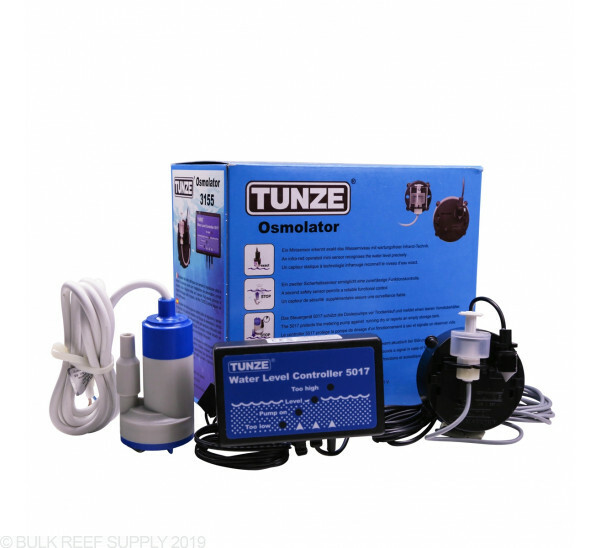 Bulk Reef Supply tried many different water level switches and auto top off solutions before giving the Tunze 3155 Osmolater Universal Auto Top Off BRS Recommended status. Despite its higher price this is by far our favorite solution. Spending the extra money on a Tunze Osmolater will give you that extra peace of mind and insurance from having a disaster that ruins carpets or hard wood floors. For the value, and reliability it is hard to beat. The Tunze Osmolator 3155 is one of the safest ATO’s available. It utilizes an electronic eye sensor to monitor water levels and a backup float switch sensor with an optional audible alarm. The controller protects the quiet metering pump from running dry and reports an empty storage tank. Two magnetic holders for sensors and multiple mounting brackets included as well as a pump. LED indicator lights the Osmolator will allow you to visually see if their are any issues with your top off system. Two technologies of water level monitoring, and built in safety back-ups. The optical eye sensor will keep the water level very steady to keep the salinity from fluctuating in your aquarium. The Osmolator does work well with kalkwasser. Note: With any pump, kalkwasser can cause premature wear. New pumps are available at a very reasonable price.